SIX SETS for the price of FIVE! 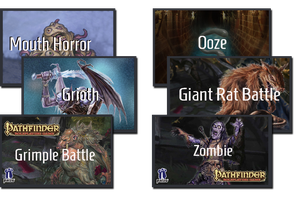 : Mouth Horror, Grioth Battle, Grimple Battle, Ooze Battle, Giant Rat Battle, Zombie Battle. This SoundPack brings you a really gross creature literally covered with 'gibbering' mouths, a horribly shrieking Grioth, crazy mad annoying Grimples, a slimy sloppy Ooze, diseased rats and shuffling Zombies! Sounds lovely doesn't it. Sounds like a whole evening of fun all ready and waiting! This SoundSet was imagined, compiled, designed, created, mixed and finished by Benjamin Loomes of syrinscape.com.